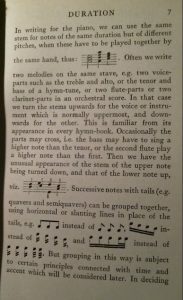 Although Mason scheduled a piano curriculum into the PNEU programmes, I believe this method could be used for all instruments. The PNEU used The Child Pianist by Mrs. Curwen for piano instruction. You can find The Teachers Guide to Mrs. Curwen’s Pianoforte Method ( the Child Pianist) here. Parents who have some piano experience and would also like to save money could easily use this program at home with their children. I suggest that you read this guide first thourougly so you understand the methods and then you can work through it with your children. The only free Student book I have been able to find online is her Step One Child Pianist book. You could print this and then try using the teachers guide with the student book. The other Steps could be purchased from England if you so desired. I have purchased several and hope to scan them and make them available in the Member Lessons as soon as I can! Students were encouraged to continue their piano playing by studying pieces by the term’s composer that they were studying for Music Appreciation. So if the PNEU was studying Bach for that specific term, the children would also work specifically on piano pieces by Bach that were at their level of playing ability. As you can see in the chart above, Forms 5-6 don’t have a piano curriculum suggested, as in forms 3-4, but continue to play pieces by the Composer for the term. They also are supposed to read several more intermediate and advanced level theory books.